Feeling the pinch or big squeeze lately in your wallet? Need to cut back on some things to make ends meet? Well take heart, because here is a list of things that may turn you back on to the word FREE and make you think twice about that phrase “there is no such thing as a free lunch”. Although that may be true, here are little gems we can get for free or almost free. 1. Using coupons is like spending FREE money. The smart shoppers use them…who doesn’t like to spend other people’s money? 2. Want to learn more about investing? Excess Return also offers a free investing ebook for beginners. 3. Movies can become expensive outings especially for families. Two alternatives are to either develop a group that rotates exchanging DVD’s or go to your local library and sign out some movies with library card. 4. If you have the time often you can get a free makeover at the local retail beautician. You will have to put up with the sales pitch but some will often give you samples even if you do not buy, because they hope you will come back. 5. Free cycle groups exist across the country you just need to be diligent in searching the sites for items you need or post what you are looking for www.freecycle.org. 6. Both phone and cable companies will often give you free equipment and free months when you switch from a competitor to them or if you bundle services they will give you more services. 7. Lots of giant retailers are getting on the band wagon of offering points on purchased items. One that I find extremely easy to accumulate to get to a spendable level is the Shoppers Optimum Card and it can be used on food, toiletries, vitamins etc. to purchase. Again this is like FREE money….you don’t have to earn it other than diligently using your card as you buy other things. 8. Newspapers can be a daily expense. If you have the time or only read certain sections, try making a point to read them at the local library or go to a coffee shop or fast food place as they often offer that as a service. 9. Music downloads can also be gotten online for free. Go to places like http://www.intunemp3.com/. 11. Cultural places like museums and galleries are often free, so check out locally which ones allow you to peruse without paying. 12. Free magazines are available by signing up. Go to here, here or here. 13. When it is your birthday go to places that either give you free cake slice, free ice cream, free appetizer etc. You can phone your local restaurants to see who offers this service. 14. Check with your local fishing license place as to what day is FREE FISHING day , when you do not need a license and can enjoy the sport for free. 15. Language translators like Google Translate. If you don’t own a computer go to your local library and use theirs for free. 16. Create a simple free website without any fees by using www.webs.com. 18. Free coffee is available from places like this coffefair. 19. Free calendars are available from real estate companies, banks and insurance companies to name a few. Why buy it when they give them away in return for advertising their business in your home. 20 Free exercises is available for a week at a time…lots of work out places will let you try their facilities for free for a week in hopes they can sell you a membership. You can also get your exercise without going to the gym. 21. Free footwear or clothing through beta product testing sites like Nike Product Testing. 22. Pancake breakfasts are often hosted by cities yearly. This is a bit of a stretch but it does happen, so tap into your city hall and find out when they put on the free pancakes to the public so that you can get in on your stack. Other free food options include being a kraft taster. 23. Games and software can be enjoyed for free and by giving feedback to places like Microsoft. 24. Sign up for newsletters and get chance to receive free products. 25. Use promo codes for free add-on items for things like vitamins. 26. Lots of samples can be gotten online for free just by signing up. Use sites such as brand samplers or free sample surprise. Contests are a way of “possibly” getting things for free in exchange for entering your name. Often if you approach radio stations either by phoning in or by getting to their mobile locations they can give you anything from tickets, to music download cards, to key tags and more. 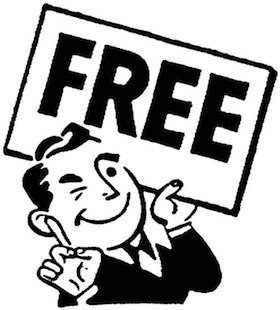 The more you talk to other people about freebies the more you will learn about things that are so called “FREE”. Even banks will offer free money with a hitch that you deposit money in a certain amount or open a specific account. Check out ING DIRECT [This Orange Key 42753252S1 will get you $25!] or CapitalOne 360 for $50! How about a free ice cream (and free fees) to save you from melting in the summer heat? Check out PF Financial No Fee. So feel free to keep your radar on for the next new free item or give away. The beauty of it is , it seems to give people a little extra smile inside when we feel we have locked on to something we can get for FREE! Enjoy your freebies. I think I speak for everyone when I say this, I LOVE FREE! Anyway, I’m glad you mentioned free fishing day, I didn’t even know it existed here in Oregon until a friend told me about it after the fact this year….definitely something I’ll be taking advantage of next year. Hey, I’d love to see you in the conversation over at CNA, I just made some really big changes. Would you mind stopping by to share your thoughts?